Blood vessels are not mere conduits for the body’s fluids; they also control essential biological responses and are an important therapeutic target in cancer and cardiovascular diseases. The vascular system is distributed throughout the entire organism and is very heterogeneous, adapting its structure, function and genetic program to the different organs. The progression of many diseases is dependent on the vascular system, and its transition from a quiescent to an angiogenic state. The molecular mechanisms responsible for this transition are similar to those responsible for the normal process of vascular development during embryonic or tissue growth. Our laboratory’s main objective is to obtain a better understanding of how distinct signalling pathways control the different context-dependent behaviours of the diverse cell types that compose the vascular system and that are essential for new blood vessel formation. This knowledge will be fundamental to better modulate angiogenesis in damaged, ischemic or growing tissues. Our laboratory has a strong expertise in methods of molecular biology, mouse genetics and imaging. In the last years we have put special effort in generating new genetic tools and mouse lines that allow us to understand gene function with higher cellular and temporal resolution. As an example, we generated recently ifgMosaic mice, in which we can induce at any given time point and in any tissue, multispectral and combinatorial genetic mosaics (Pontes-Quero et al., 2017, Cell). In these mice, different cells of the same tissue express different genes that are associated to specific fluorescent proteins, enabling the direct imaging and comparison of distinct cellular phenotypes caused by the expression of different genes in the same field of view. This is essential to understand how individual genes regulate the biology of single cells, during a given biological process (Movie 1). In the next years, we will continue to develop new genetic technology of broad relevance, in order to be able to analyse gene function with higher accuracy and resolution in vivo. 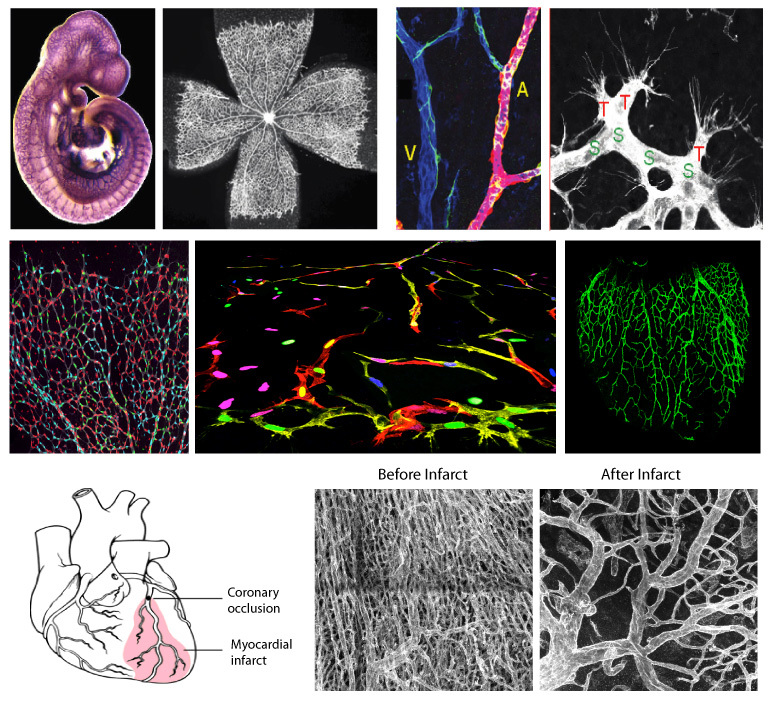 This will allow us to better understand the main genetic mechanisms controlling the biology of blood vessels, not only during tissue development but also in homeostasis or in disease. This knowledge can be later used to effectively regulate angiogenesis and vascular function in diverse physiological and pathological settings (Figure 1). Figure 1: Our laboratory studies cellular and molecular mechanisms important for the biology of blood vessels in a variety of physiological and pathological settings. Movie 1: Time-lapse imaging showing the initial stages of embryonic stem cell differentiation to endothelial cells, and after the process of angiogenesis, where ifgMosaic endothelial cells sense chemokine and growth factor signals that induce their migration and proliferation. The mosaic dual fluorescent and genetic labelling allows us to image single cell behaviour and correlate it with gene function. Cells having distinct genetic alterations, have distinct differentiation, migratory and proliferative behaviours.